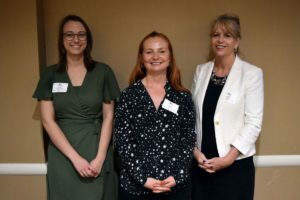 On Tuesday, April 10, the Greater Phoenix Chamber of Commerce (the Chamber) hosted Jenny Weitz, Paradise Valley Community College’s Honors Program Director Professor. She shared her journey of breaking into the Science, Technology, Engineering, and Mathematics (STEM) field. Weitz holds a Bachelor of Science Honors Degree with High Honors in Physics from Sweet Briar College in Virginia. Her subsequent graduate research in cosmology earned her an M.S. in Physics from the University of California at Davis. She has taught astronomy at Paradise Valley Community College (PVCC) since 2010. During college, Weitz had primarily male science and math professors, and as result, she didn’t really see herself in her field until a professor told her that she was going to do research. That was the moment she knew she wanted a career in science. Through her time in graduate school, she discovered a love and a passion for teaching science, which is how she found her path to PVCC. At PVCC, 56 percent of the students are women. In spite of this though, nationwide, according to the Economics and Statistics Administration, an office within the U.S. Department of Commerce women are underrepresented in STEM. In fact, only 24 percent of STEM jobs are held by women. When it comes to getting women involved in STEM careers and, then leadership positions in the STEM field, the problem starts long before women enter the workforce. Women only hold roughly 30 percent of all STEM degrees in the country. With a focus on increasing women and girls’ interest in STEM, Weitz and PVCC are fostering interest in the local community. 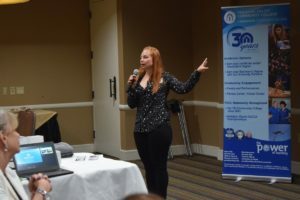 Through events and education outreach, those programs are making a difference and connecting female students to mentors in the industry. It’s clear that there is a lack of women represented in the STEM field and a smaller number of women studying STEM. As an added perspective, attendees heard from one of Professor Weitz’s students who is entering a STEM career herself. From Weitz’s remarks, it’s clear that it’s long overdue for women to reach parity in STEM careers and in STEM programs on college campuses across the nation. Join the Greater Phoenix Chamber of Commerce for the next Professional Women’s Alliance luncheon on Tuesday, May 8. Amy Bruske, President of Kolbe Corp will help you understand how misguided beliefs about work are causing unnecessary stress, and she will provide key strategies to manage your mental energy for optimal performance. Register today!